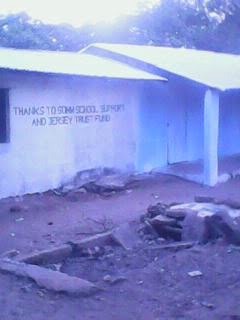 As the school year comes to an end, in The Gambia and back home, it seems a good time to review progress of our support to the schools Sohm, over recent months. It has been a very productive year, as far as the charity is concerned. Sandra and John spent a month in The Gambia, in January and set in trail a number of initiatives that have now come to fruition. 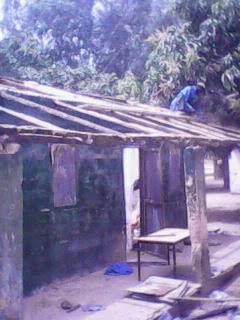 Our latest, and most ambitious, project was to restore two derelict classrooms at the Lower Basic school, and bring them back into use - thus relieving over-crowding in a school, where 60 pupils in a class is the norm. and restored to full use! Because Sohm is so remote, the school and Education department provides residential accommodation for Lower Basic teachers in the village. This is now over 30 years old, and has not been properly maintained. So, we have been able to refurbish all of this accommodation: providing new roofs, doors, and windows, repairing broken walls and plumbing systems, over the last four months. As a result, teachers now have decent housing, by local standards, which improves their well-being and comfort, from which the students will indirectly benefit. We now provide support to the Lower Basic school, each year, as they approach their external examinations. So, we pay for duplication of past papers, to help with preparation, and other teacher support, for this year's. Last year this resulted in a significant improvement in the final examination results the pupils sat. We are hopeful that our support this year will have a similar impact. We have just funded the annual school trip for 180 years 6 and 7 students at the Lower Basic school. This has meant a visit to the country's capital, its only airport and the Atlantic Ocean for the first time, for many of these 10 and 11 year olds. This is truly a mind broadening and enjoyable event for these youngsters, as they leave their primary school. The letters we received from last year's attendees were detailed and fascinating (and available for all the charity's supporters to see). They confirmed our view of the value of this trip for the youngsters. Working with our good friends at Football Gambia and Kit Aid, we have been able to give considerable quatities of sports kit and equipment to the pupils of both senior and junior schools in the village this year. We have provided the junior school with sports equipment, which will help with their physical development and education. Football Gambia enabled us to supply over 60 full football strips to the senior school - and they were given a pride of place demonstration at the school's recent sports day. As a result of the support we are given by a dozen or so supporters, we continue to directly sponsor students at both the Lower Basic and Senior Secondary schools. We equalise the payments over the expected school life of each pupil; so we can provide sponsorship for a standard flat rate of £60 per year (£5 per month, preferably by standing order). This, with the Gift Aid we can claim, provides the fees (school and examination) to enable youngsters to attend school, throughout their school lives. Sponsors are sent a letter of thanks, school report and recent photo of the pupil, each year. In January we supplied every pupil in both the Senior and Lower Basic schools with a selection of appropriate stationery equipment - relevant to their specific age and needs. So, there were a couple of exercise books per pupil, a range of graph and drawing paper books, pens, crayons and pencils for each school. These were greatly appreciated by all - as the photos illustrates! Thanks for the excercise books!! As a result of generous donations of surplus laptop computers in previous years, we have been able to supply the Senior school with equipment to assist with ICT studies, where there is no mains electricity. Almost inevitably, however, many of the donated laptops had batteries with short power storage capacities. This year we have been able to source a number of cheap battery replacements for them. This has increased battery lives of the laptops, from about 20 minutes to over two hours, on average. It has greatly assisted with ICT teaching. Additionally, a good friend recently gave us 120 memory sticks, so that most of the ICT students can now have their own work on their own device, for use on any PC where they do their work. A great, and much appreciated advantage for the Sohm youngsters. Last year we established a book fund, so that every senior student in the Upper school had shared access to a relevant textbook for all subjects. We were able to top this up,this year, and the government is now offering a similar arrangements for the youngest age group pupils! A real victory in the pursuit of raising educational improvement. As many as 50 students walk at least 3 miles to and from the Senior school each day. It has been given bikes, in the past, from Jole Riders, to help with pupils' travel arrangements who live furthest from the school. Many of the bikes, however, have fallen into disrepair. Last year we were able to fund an overhaul of many of them. This year we supplemented this with the provision of a number of cheap puncture repair kits, pumps and replacement saddles, to encourage pupils to take responsibility for their own bikes. Our good friends at Derwentwater Primary school in Acton have continued to assist us in raising funds for the charity - and thus for the students in Sohm. We have recently raised £100 from a raffle at the school's summer fair, which when added to the money raised at the Christmas fair, and associated Gift Aid, means that we will be able to take over £300 form our Acton friends to Sohm next January. This will, for example, pay for the much needed and appreciated schools trips, or the annual stationery donation to the Lower Basic school. Thanks to a generous donation by our friends at Auchmuty High school in Glenrothes, in Fife, we were able to considerably equip a science laboratory in the Sohm Senior school this year, where previously there was none. We aim to raise about £5,000 per year. Our friends and relatives who sponsor students contribute about £1,000 of that, and Derwentwater Primary school has provided as similar sum, over recent years. We have, additionally, been able to raise another £1,000 via a presence at jumble and car boot sales and the odd sale of unwanted gifts via e.bay etc. Very generous one-off contributions from good friends has usually ensured that similar sums are given to the charity each year. Now - that missing £1,000? Well, odd cash earnings from bits of paid for work contribute to that. But .. we are always open to all offers of cash, or goods that can be sent to Sohm, or sold to raise funds for the schools there. So, anything you can offer, to continue what we believe is a good value-for-money project in this remote African village, for the educational benefit of literally hundreds of deprived young people would be much appreciated.